Many years ago we aquired a Dake Reference Bible and we are still amazed at the amount of material Finis J. Dake put into it. Although I don't agree with some of Dake's doctrine, his Bible is full of countless notes, topics, and lists of Bible data that are very helpful. 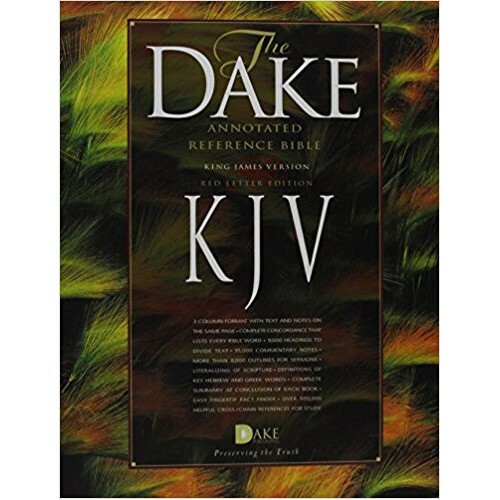 Dake spent more than 20 years of research, over 100,000 hours, in compiling this reference Bible which includes over 35,000 commentary notes which contain over 500,000 cross-references. There are over 5800 lists and topics that can be easily filtered by an entered string. Thousands of passages are amplified. Obscure readings are made clear. Ancient customs are explained, along with matters of history, culture and geography. Greek and Hebrew words and idioms are handled. In addition, parables, types, symbols, allegories and figures of speech are dealt with. Dispensational issues are treated in a systematic fashion, along with hundreds of details of biblical prophecy. All the Hebrew and Greek words are tagged with Strong's Numbers which makes the Strong's dictionary data available with mouseover or click. All the topics and lists are in a Dictionary module and viewable by mouseover or click from links in the Notes module. All the Topic and List titles are instantly filtered by typing in the Dictionary Entry Box. The referenced Bible text in the notes is bold red. Plus, Dake's chart The Plan of the Ages is included! The image below shows some of the features including the interactive Topic/List links in the Notes, the Topic entry in the Dictionary, and the Topic list dropdown. Finis J.Dake was a Pentecostal/Charismatic minister who was not without controversy. He held a few doctrines that are not considered "orthodox" by many today. As with any other resource, Dake's material must be read with a discerning eye. We believe there is much that can be gained from his material in spite of these issues. As with any commentary or reference work one must "feed on the clover and spit out the thornes." Along with the Notes and Topics, included in this bundle is Dake's large and detailed chart, "The Plan of the Ages." This full-color chart is patterned after Clarence Larkin's charts and also has mapped hotspots over the Scripture references. This huge chart is nearly 5000 pixels wide and is viewable in the Bible Analyzer Image viewer. 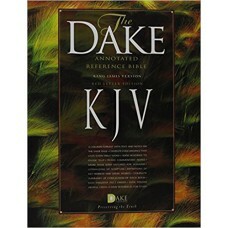 The publisher has given us exceptional terms to distribute the Dake Annotated Reference Bible for Bible Analyzer. We are able to offer it with more features and less cost than any other software developer to date! This is 50% less than from any other developer! Most charge from $40 to $125 for less material!